Well, one can knit up a whole lot when she’s spending four hours a night after the baby and the husband are asleep watching television. But now that my Scandal fever has subsided (it got pretty stupid after the whole B613 plot line), I regret for being so unproductive and shaving off precious sleep time while indulging in guilty pleasure, but I’m glad I at least have a rainbow of cozy cowls to show for! I think I become equally obsessed with knitting these cozy neck warmers as I got with watching the show. I just couldn’t put down the knitting needles. They knit incredibly quick just like the show’s plot, and the pattern is timeless like all the chic wardrobe worn by stunning Live, Abby, Quinn and Mellie, my absolute fave. I think Blue Sky Worsted cotton is my favorite yarn at the moment. And I love the fact that you can toss them in a washer because it’s 100% cotton. Because I didn’t know what to do with all these cowls, I decided to extend them to my friends. I was going to sell them on Etsy but wanted to reach out them first to see if any of them was willing to support my knitting addiction. I’m so happy to report that many contacted me immediately after posting the photo on Facebook and these cowls are almost sold out! 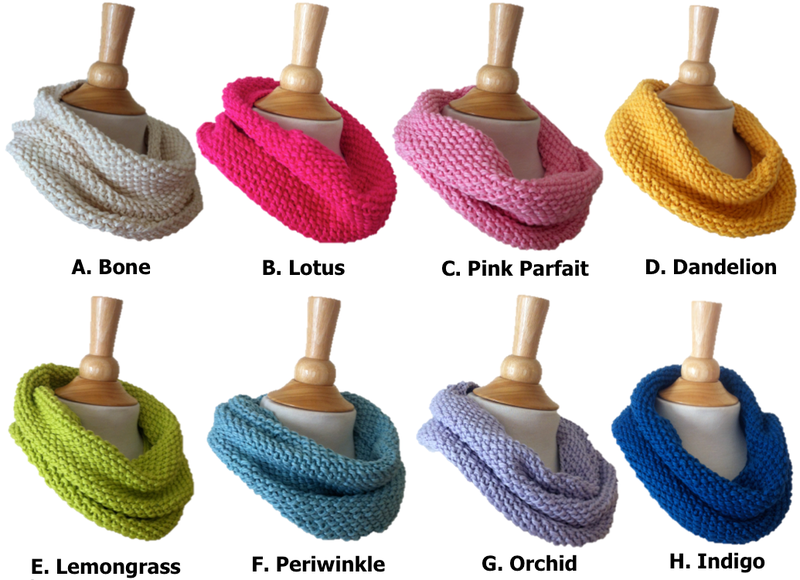 (Updated on 12/4/14: All the cowls have been sold! Insert happy dance here!) Yipee! That totally made my day! I get so excited when things I make find a new, loving home. I hope they enjoy the cowls as much as I enjoyed knitting them. For more information about the cowls, including the pattern, please see here and here. These are the Blue Sky Worsted Cotton yarns I purchased, with an intention to knit a baby blanket for a friend. The combination looked so lovely at first but it didn’t work for me when I actually knit them together. I think it’s because some of the colors are so similar (too similar, in fact) and the dark green skein stood out like a sore thumb. Whatever the reason, this combination just wasn’t meant to be. Individually, however, they are stunning! It’s worsted cotton so it’s nice and slippery which makes knitting – especially with Turbo Addi needles – such ease. I’m so glad I decided to turn some of them into simple seed stitch cowl (others were knit into a pair of fingerless gloves). Of the three I knit so far (here’s the first one I knit and the pattern), the lavender one is probably my favorite. I purchased a few more skeins of the same Blue Sky Worsted Cotton yarn to turn them into more cowls. There goes my plan to reduce the yarn stash but it’s just too much fun to knit with them! Maybe I’ll sell a few to justify the impulse purchase! Let the holiday knitting commence!